Because the fine people at Etsy asked me to be their featured seller and I wanted to have lots of things ready! It was kinda fun staying up really late to pack up orders although there is no doubt in my mind that I'd rather be making books than packing & shipping them! And here is a photo of some books made recently. The one on the bottom is over 30cm square (12"x12") and really thick. The one on top is about 7cm square (3"). I had such a wide range of book sizes that I just had to take a photo. IT TOOK THEM A WHOLE YEAR TO FIND OUT WHAT I'VE KNOWN.....YOU ARE AWESOME! CONGRATS ON THE ETSY FEATURE. I'M STARTING FRESH ON NLITENEDSOULZ RADIO AT THE BEGINNING OF THE YEAR AND I WILL MAKE SURE TO LET THE WORLD KNOW ABOUT YOU AGAIN!! KEEP DOING WHAT YOU DO BEST!! Whoohoo for you Rhonda!! I have been a big fan since I first found you on Etsy!! I do love your fabulous books!! I just discovered the art of bookbinding and you. I have tried my hands at it and find it very relaxing and fun. I've already signed up for a bookbinding class out here in PA at the University of the Arts. Do you have any online tutorials yet? Congrats -- as a new bookbinder myself, I love checking out your etsy shop! 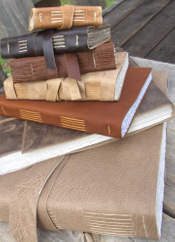 I have a question for you, though ... do you make handsewn journals with lined paper, and if so, do you have your own printed or have you found someplace to purchase it online? Congrats again! You are a wonderful "public face" for bookbinding on Etsy! I was very intrigued by your Featured Seller article on Etsy! I think that's the first time I've ever read a whole interview on Etsy and delved further into the artist's shop/blog. Your leather journals are so beautiful and it looks like you've truly mastered your craft. I've been reading your blog for most of 2008. I love your books! I would like to tag you for the Y Things Meme. It's a great way to build community! Happy Holidays! Rhonda, I am lurking, reading, enjoying. I've finally managed a post today, probably last one for a month or so. Season's greetings from Sydney. Congrats on your feature and subsequent sales Rhonda! I am so excited to be giving one of your beauties away on Christmas morning. Congrats a thousand times over for being a featured seller — your stuff is AMAZING. Woohoo! oooh, the idea of the big 30x30 one gives me all sorts of ideas! Thanks for all your comments!! it was lots of fun being featured, but also a lot of work. So much packing tape was used!